Scientists with the U.S. Department of Energy’s Lawrence Berkeley National Laboratory developed a way to chemically assemble transistors and circuits that are only a few atoms thick. 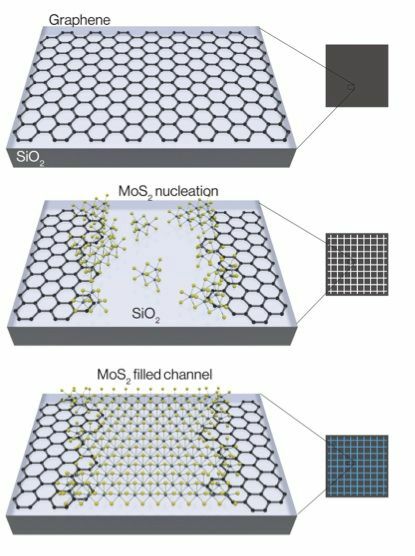 The team controlled the synthesis of a transistor in which narrow channels were etched onto conducting graphene, with molybdenum disulfide (MoS2) seeded in the blank channels. Both of these materials are single-layered crystals and atomically thin, so the two-part assembly yielded electronic structures that are essentially two-dimensional. In addition, the synthesis is able to cover an area a few centimeters long and a few millimeters wide. The two atomic sheets meet to form nanometer-scale junctions that enable graphene to efficiently inject current into the MoS2. These junctions make atomically thin transistors. “This is a big step toward a scalable and repeatable way to build atomically thin electronics or pack more computing power in a smaller area,” says Xiang Zhang, a senior scientist in Berkeley Lab’s Materials Sciences Division. “This approach allows for the chemical assembly of electronic circuits, using two-dimensional materials, which show improved performance compared to using traditional metals to inject current into TMDCs (transition-metal dichalcogenides),” says Mervin Zhao, a Ph.D. student at Berkeley Lab and UC Berkeley. Additionally, the team demonstrated the applicability of the structure by assembling it into the logic circuitry of an inverter. This further underscores the technology’s ability to lay the foundation for a chemically assembled atomic computer, the scientists say. Researchers from Los Alamos National Laboratory, Northwestern University, and Rice University tweaked their perovskite crystal production method, developing a new type of two-dimensional layered perovskite with outstanding stability and more than triple the material’s previous power conversion efficiency. 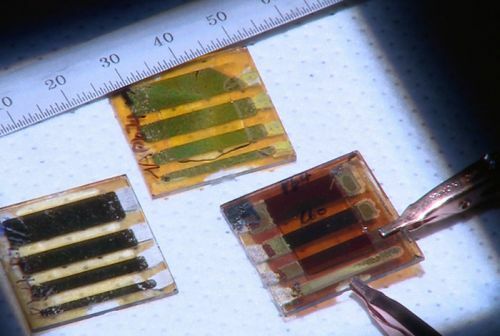 The challenge has been to find something that works better than 3D perovskites, which have remarkable photophysical properties and power conversion efficiencies better than 20%, but are still plagued by poor performance in stress tests of light, humidity and heat. 2D crystals previously studied by the Northwestern team lost power when the organic cations hit the sandwiched gap between the layers, knocking the cells down to a 4.73% conversion efficiency due to the out-of-plane alignment of the crystals. But applying the hot casting technique to create the more streamlined, vertically aligned 2D material seems to have eliminated that gap. Currently the 2D material has achieved 12% efficiency. IoT comms; smartphone privacy; portable gluten sensor. Detecting zeptojoules; combo inspection tool; FIB lab.